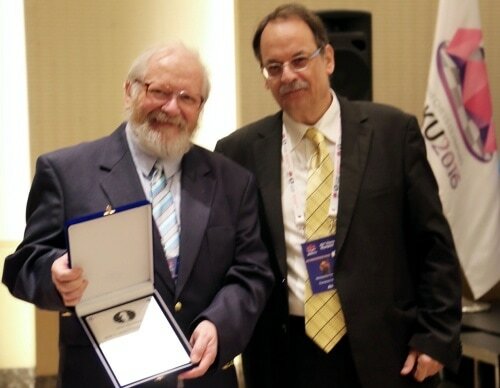 Tuesday, 20 September 2016 – the 2016 Arbiters’ Awards Ceremony took place on 12 September in Fairmont Hotel, Baku, Azerbaijan, during the General Assembly of the FIDE Congress. Five of the Awardees (Jorge Vega, Faik Gasanov, David Welch [pictured, left], Yuri Lobanov and Venkatesh Kameswaran) were present and received their awards from the Chairman of the FIDE Arbiters’ Commission Takis Nikolopoulos. The rest were represented by Congress’ participants.